Recently, I had another reason to nominate myself for the “Mother of the Year” award. It seems that these moments come all too often. 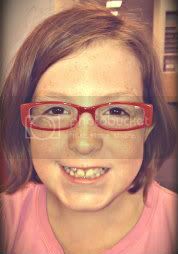 Earlier this summer, I decided I was going to get ALL the kids eye exams early so we would beat the back to school rush. When I was scheduling, I found out that I, candidate for “Mother of the Year,” have somehow failed to get #3’s eyes check. EVER. Somehow, she got to 8 1/2 years old without ever having an eye exam. Somehow, she finished second grade having never had the STATE MANDATED kindergarten exam. AND… she needs glasses. She had been complaining, but I, her devoted mother, didn’t take her to the eye doctor. Yep. Mother of the Year. Today we picked up her new accessories. She was SO excited… at first. Now, she says her eyes hurt. But she is pretty cute in them! I have been on a quest to feel better. This year this has been one of my goals. I have floundered often, but I keep getting back on the proverbial horse. I may be 36 years old, but that does not mean I have to feel like crap. HOwever, I have been so stinking busy doing everything for everyone, I have ceased really taking care of myself. I know that you make time for what you want, but honestly, when it came down to precious sleep or exercise… well… You know what won out. Lets not even talk about healthy eating. I tried… sometimes. This summer has been about recovery for me. I have needed to regroup, and I can honestly say that in the last month or so, I have started to feel like ME again. Now, that I am recovering I have been trying to implement some changes. I realize that I can’t change everything at once. I know that you are shocked that I am finally realizing this truth, but I am now 36, I should grow up sometime. Sooo, instead of going on a diet, launching a new exercise plan, give up Diet Coke, eating right for my blood type, becoming a vegan, and eating organically, and taking up Tai Chi all at once, I am trying to make LITTLE steps. What a concept! Gradual change for lasting change… right? So two weeks ago, I got myself up and moving again. I laced up my running shoes and dusted off my bike. To date I have put over FORTY miles on this body. I told my husband (and he thought I was nuts) that my heart just felt happier with me. It doesn’t act like it wants to revolt every time I bend over or run up the stairs. While we were on vacation, I started to reduce my caffeine intake. When we got home, I quit it all together. I am currently 13 days off of my beloved Diet Coke. The funny thing is that don’t even miss it now! I have had a few Caffeine free Diet Coke, and that has been fine. However, I don’t have any soda in the house, and I just don’t need it. I am not AS jittery as normal either! AND, I saved us like $100 a month… or MORE. So, what does this all mean besides just flat out feeling better? MY blood pressure has dropped 20 points (top number) and 10 (bottom number) in just TWO WEEKS!!! I don’t know quite how and why we went wrong, but something isn’t right. We have four kids that are TERRIBLE at picking up after themselves. I realize that I have exactly been the model house keeper, especially during the busier times. However, I really thought they were grasping what I expect from them. I expect them to NOT leave wrappers from whatever the just unwrapped anywhere they wish. I expect them to pick up the clothes that come off their body, and not leave them in a heap wherever they fall. I expect them to pick up toys after they play with them. I expect them to put things back where they got them. Sure, I expect them to whine here and there about chores, because I realize they are kids. However, I expect them to do said chore with a good attitude. I don’t think that these seem like ridiculous expectations either. This summer, I have been trying to crack down on this stuff, but if it is working, it isn’t working fast enough. Yesterday, I got asked an interesting question. I was sitting with a very young wife of a church planter, and she was filled with many questions about this amazing journey. She asked me many questions, but one sticks out even now. She asked, “What is the most amazing thing you have seen God do through this journey? At first, my answer was a mess. I really wasn’t sure what I could point out as the most amazing thing that I had seen. Then I remembered the thing that hit me a few months ago. The most amazing thing I have seen is God’s transformation of my husband. We have been married fourteen years and we have had our ups and downs. Anyone who tells you otherwise is either lying or naïve. Marriage is tough work, and maybe we have had to work harder that some others because we married at a pretty immature and stubborn state in our lives. God has been good to us, and helped us carry through the tough times. If it weren’t for Him, I am pretty sure that there were some times that we wouldn’t have made it. Not that I am perfect in ANY WAY! That is not what I am trying to portray, but my dear husband had some…. Let’s say, rough edges. I have watched this man transform before my eyes in the last few years. We all still chuckle when we think of a frantic phone call from him on an Uncle Nick’s run when #4 was in NICU shortly after we arrived in Rockford. He had taken a wrong turn and he was lost down in the bad area of town after dark. He was quite unhappy and pretty concerned for his safety. Now, I watch that same man spend time in the same area eagerly. He ministers to the same people that he used to avoid. His heart is broken for these people he used to be frightened by. I watch this man give everything he has to minister to people. In the past, that same man was “so over” ministry and the stinking people that went with it. Yet, now, God has given him this overwhelming desire to spread the gospel to whoever crosses His path. I watch a man who swore he would never be in full time ministry want that very thing with his entire being. I watch this man who had a quick temper and a biting wit beg God to control it, and He does! I know he isn’t perfect, and his mouth gets him in trouble from time to time, but I also see that same man return broken for the way he spoke. Every time it happens, I still feel like I have to pick my jaw up from the floor. I watch a man who is filled with kindness and compassion for those even I do not want to help at times. I find him willing to give and share and help even when he does not have any left to give. I watch a man who has always had a love for doctrine, turn and take that head knowledge and have it sink deep into his heart and soul. It has made him a different man. For years, I prayed that God would “fix” him. I begged God for all the things that I thought I needed him to be. Several years ago, I got the book The Power of a Praying Wife. I grabbed the book with an excitement that this was going to be truly the answer in the “Fixing” department. I figured, I would just pray him into God’s will. Well, was I shocked! The first chapter took all my preconceived notions about how to fix him and tossed them right out the window. I learned to truly pray for my husband in a different way, and pray that I would be the wife HE wants me to be for him. Even though my attitude had changed, at times I would think about how he was going to get good and fixed right up. A few months ago, it hit me. God was working it out in His time. He revolutionized my husband right before my eyes, and I was too busy to notice it! What an amazing gift he has given me. I get to married to this incredible guy who is in love with His Lord and me! Can it really get an better than that? We spent our day at Plant Chicago. Plant Chicago is part of Plant Midwest which is a group from the IBSA that helps train church planters. This is the first training event that I have actually been able to attend. This is of course, because I am actually able to spend the time with my husband in training for what we are called to do. #1 Most of the church planters are YOUNG… or at least seem WAY YOUNGER than us! One of the leadership referred to himself as the “not young, but not old” crowd. Yup, that is us. I realize that I am officially not young anymore. One of the church planters that met today was twelve and half. Okay, so he just looked that young, but he was really 25 with a wife. I remember when I was a young whippersnapper….sigh. #2 Church planting is tough… EVERYWHERE! Sometimes, I look at our insane life and think that there is no way anyone can understand. Our situation while unique, is just a different kind of unique. Church planters all over deal with interesting things and face interesting situations continually. #3 Victory in Jesus can be performed with guitar, bass, keyboard, and drums. I am not sure how I feel about it yet. The fact that I am not young might affect my evaluation of the song. #4 I wish more women came to these events. I realize that women are busy. I have been one of those women. I know that many times if your family is living the life of church planters, the wife often has to work as part of the sacrifice. I would love to see more wives able to take part of events. Women are wired to need the camaraderie of other women. These kind of events are perfect chances for us to connect. #5 People who talk continually during the sermon annoy me. If you need clarification refer to the “I am old” concept in #1. #6 The theme, while directed to our church planter husbands, it timely for the wife too. I needed to hear what I heard today. The first session in particular impacted me. I have heard often that if you don’t take of yourself, there is no way you can take care of anyone else. Well, the speaker Joe Thorn, whom I enjoyed thoroughly, preached about shepherding your own heart, so you can shepherd those you serve. Amazing. The second session was directed more to the shepherding of the flock your have been given, but as a wife if reminded me of what I need to be helping my husband with. After all, that is my job, to help him! It is important to that we know what we are supposed to be helping with.